Tour the world with U City restaurants! Tickets are $20 in advance and $25 at the door. Kids ages 5-12 are half off, and kids four and under eat for free. Admission includes one complimentary beverage. Many of U City’s most popular restaurants will serve delicious samples from an international array of cuisines. From Chinese, Jamaican and Middle-Eastern to pizza, fried chicken and fondue, Taste of U City reflects the diversity and variety that define our community’s restaurant scene. Tickets are also available at the Chamber office (7700 Olive Blvd.) and the University City Public Library (6701 Delmar Blvd.). To see a list of participating restaurants, check out the poster here. 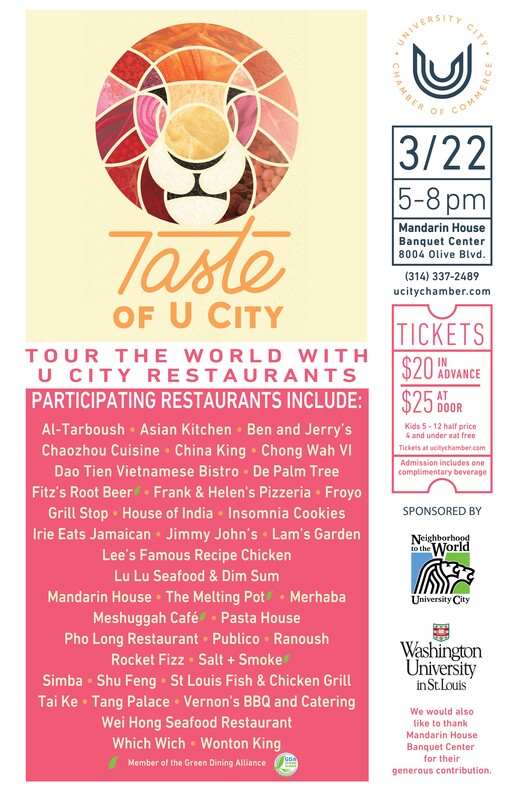 *Please note this year’s Taste of U City will take place at the Mandarin House Banquet Center, the same place as 2016 and 2017.